Appearance (0-20): Graycliff was spot on with making the G2 Turbo Edicion Limitado. The Ecuadorian wrapper has a very nice sheen to it and there are very few veins to even note on the exterior. It’s slightly oily and definitely has a nice richness to it. The color of the wrapper is well complimented by the almost rustic black and gold that was chosen for the bands. The banding is simple but has some slight ornate flair, differentiating it from the G2 and G2 turbo lines. Construction (0-20): First touch impression left me happy with the construction. Slightly weighty in the hand, I could feel that the cigar was well packed. No issues with the wrapping, and the cut revealed very little excess tobacco. The initial draw was a bit on the tight side, and unfortunately it remained that way throughout the smoke. That’s not to say it was unenjoyable, but it was certainly a detriment. The initial light went perfectly and the burn lasted for 2+ inches at a time. Strength (0-20): Medium to full is where its rated, though I believe it fell a tad short. 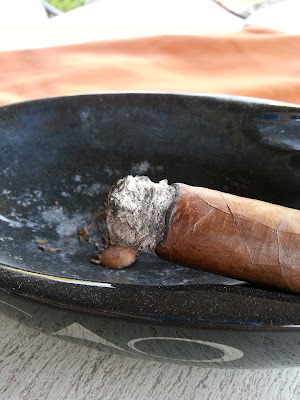 The cigar begins a little more on the stronger side of medium, but I found it was all downhill from there, landing in the lower portion of the medium scale by the conclusion. Unfortunately I was hoping for more heft. 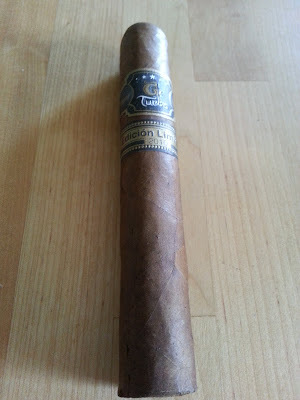 Flavor (0-20): The initial light brought in some wonderfully buttery flavors with deep tobacco richness on the back end. Some spice lingered on the tongue and through the retrohale, but more of a toast flavor becomes prevalent as you move through the smoke and mixes in with a leathery touch. The unfortunate thing is that the toast flavor is a little overpowering and lingers over the woodsy flavors that come in the final third. Value (0-20): The $6.00 price (in a 5 pack) is a little bit on the steep side of things for this particular super toro, but it isn’t completely absurd either. Additional Notes: Smoked on my father’s deck and paired with water. Overall (0-100): Breaking this one down honestly – it could have scored a bit higher in the construction area, but it was a little bit too tight to enjoy it to its fullest. That being said, if you catch one that’s got a good draw, youre onto something pretty damn good. It’s a solid stick with some good complex flavoring, but unfortunately the flavors do get a little muddled at times. 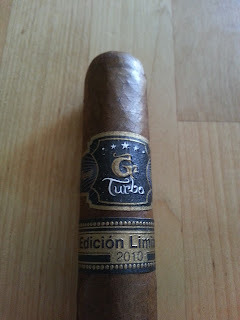 It looks good, has some decent strength, and isnt too pricey, but all the same – the G2 Turbo Edicion Limitado 2010 doesn’t do anything to explicitly stand out. While its worth a smoke for sure, I don’t think I would go out of my way to hunt one of these down. Would I smoke one again? Yes I would. Would I do anything I could to get one? No. Still, it’s a solid smoke worth mentioning.